After an extra hard sweat spinning session, I was in need of a refresher. Not wanting to throw myself into a long night of highly wired ADD a la Starbucks, I Yelp-ed “juice bars” near Union Square. Feeling like no rock hasn’t been turned in my knowledge of Union Square, I immediately expected to get University Place’s location of Jamba Juice. While waiting for the search results to upload, I headed expectantly in that direction. Surprisingly, “Jus” came up as the top result. 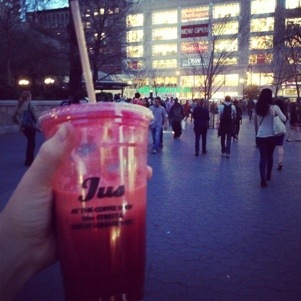 Curious about a hidden juice bar in Union Square, I headed in the direction of Jus. 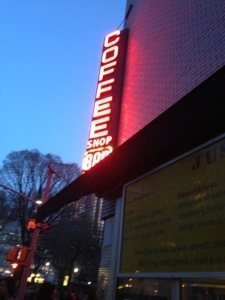 Attached to the side of the Coffeeshop Bar, this brighly colored box on 15th street near Union Square West was a gem. Offering an array of fresh squeezed juices, smoothies, and fruit tonics, this tiny juice bar is a force to be reckoned with. After debating for a while what to choose, I finally settled with one of the “Detoxing” options: a blended juice of Beet, Carrot, Apple, and Lemon. The combination was unexpected, lightly sweet, and the perfect fix for my sweet tooth craving. I was deliciously satisfied, sans the caffeine kick, and was proud of my healthier option post gym. For an affordable $6-$8 a juice/smoothie, this stand is affordable and a diamond in the rough. Whereas you might have to worry about hidden added ingredients in the drinks, the product is made fresh in front of you. Most of the options are gluten, dairy, and preservative free. As Spring starts to heat up, I highly suggest checking out Jus Juice Bar. Try saying that three times fast.